Overnight, the weather had turned colder and rainier. We packed, checked out, and waited inside the hotel lobby for our cab ride to the Western Railway Station. 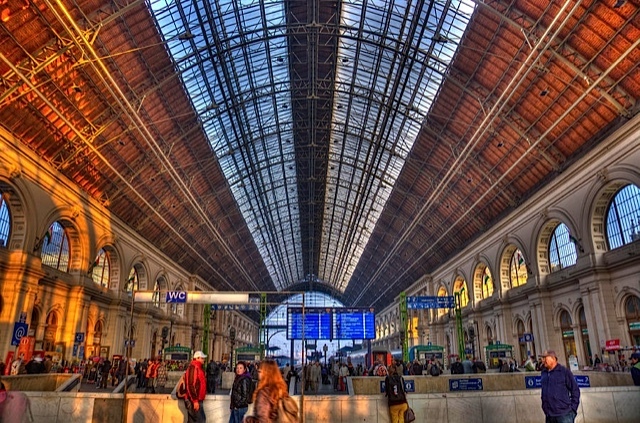 There, we planned to catch the express train from Budapest to Prague, about a six-hour trip. On the railway platform, Dave kept asking me not to lag behind. I was quite taken by the architecture of the building. Not modern by any means, but the unique design reminded me of something, but I couldn’t think what. Later, after some research, I found my answer. The Western Railway Station was designed by August de Serres and built by the Eiffel Company of Paris. The construction took three years to complete, and the iron building was cast in Paris. 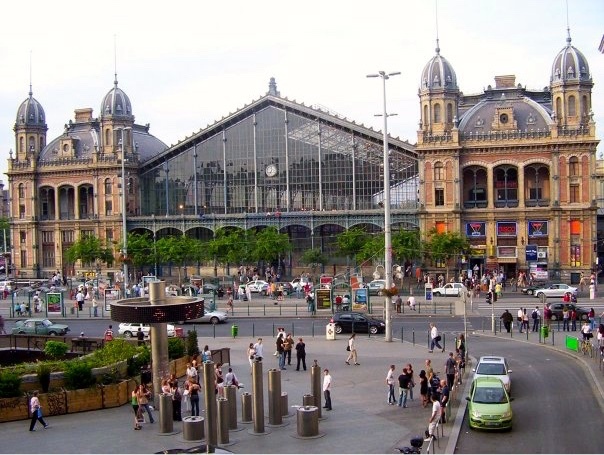 The station opened in 1877, twelve years before the Eiffel Company built the famous Eiffel Tower. To date, the train station has retained its original style. Over the years most of the old iron structure has been recast and replaced. 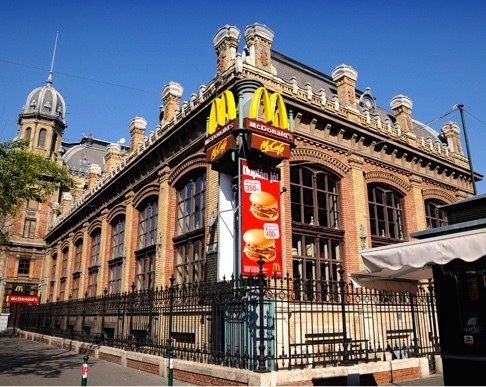 Yes, the building houses a McDonald’s, but as many have said—and I agree—it is the most beautiful McDonald’s in the world. Slightly lost as to which train to board, we were scoping out the station when a man hurried toward us saying, “Prague?” He yanked my roller bag out of my hand and took off. I scurried after him. He climbed the steps to a nearby train and demanded my ticket. I showed it to him but held on tight to it. He ushered us toward a compartment, hoisted my bag, along with Dave’s, into the overhead rack, and stuck out his hand. Dave gave him the equivalent of a six-dollar US tip in forints. The man looked at the money, looked at Dave, and back to the money, all the while shaking his head. Then he said, “Euros.” Dave dug into his pocket, took out the equivalent of an additional four dollars US, and said, “That’s it. No more.” Grumbling, the man walked away with his ten-dollar tip. We had booked a semiprivate compartment, which meant we shared it with one other couple. We had just settled into our assigned window seats when the other party arrived, led by the same man, and he followed the same routine. He pocketed his forints and euros, and left grumbling. “I’ve never heard anyone in New York complain about a ten-dollar tip for two small bags,” said the man to his female companion as they made themselves comfortable in the seats next to us. Some friends who had taken the same train trip the year before said the scenery offered nothing noteworthy, so pack a good book. I planned to spend the time writing my next book. However, I had read Brno was the most scenic part of the trip, and after scrolling through images on the Internet, I realized this town would have been an interesting place to visit for its scenery—and its architecture. 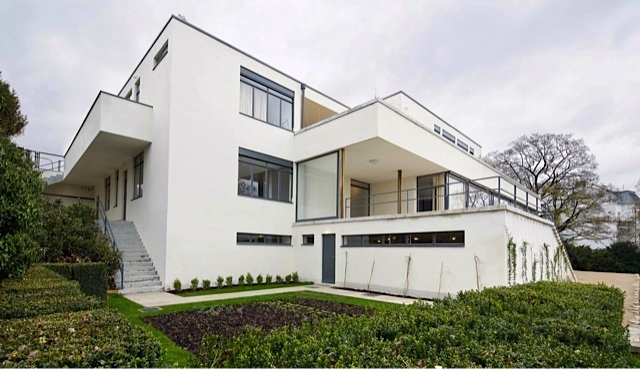 From the moment I first saw a photo of German architect Ludwig Mies van der Rohe’s Villa Tugendhat, an icon of modernism, I found it hard to pass Brno by. But I had no option; it all came down to time. As the train left the station, we struck up a conversation with our compartment companions, Kath and Tom, two attorneys from Albany, New York. They were drawing to a close on a nine-week backpacking trip through Europe and “parts beyond,” as Tom put it. Between chatting, writing, and a short break to eat a ham and cheese sandwich, the ride moved along quickly. As we neared Brno and the Austrian border, we left our compartment and headed to the opposite side of the train to photograph the beautiful farmland. Someone mentioned we were passing through a biosphere area. 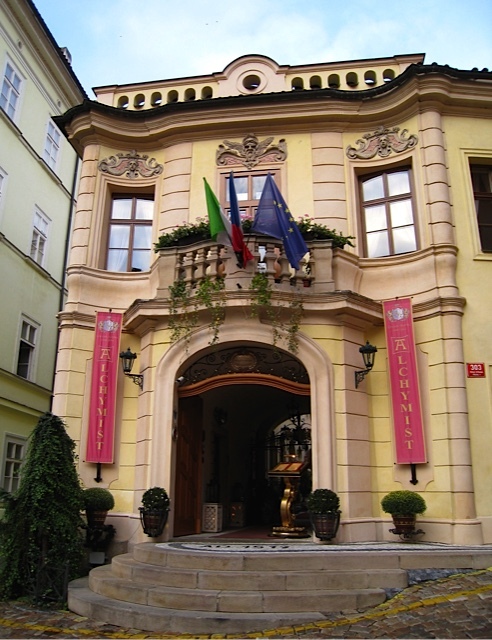 Six hours later, we pulled into the Prague train station and wished Kath and Tom goodbye, then walked the two blocks to the taxi stand, where we caught a ride to the Alchymist Grand Hotel. As we neared our accommodations, an officer at a police checkpoint stopped and searched our cab. Later, we found out the Alchymist was located across the street from the US Embassy, and the search was a precaution. I noted this incident for a future book scene. At check-in, while we sipped champagne served by the hotel staff, we were informed of a large family group staying on the lower floors, so we had been upgraded to a suite. The room was comfortable but a bit dark, and the overhead lighting poor. I drew aside the heavy damask curtains to let in more light, but the small dormer windows didn’t admit much illumination; that, coupled with the overcast day, meant no sun to brighten or warm the space. However, the soft lighting gave the room a certain ambiance. Never one to overlook an opportunity, I used my active imagination, immediately envisioning this setting as one for a scene in a future Darcy McClain and Bullet thriller. So while Dave unpacked, I typed notes into my iPad and photographed the room for future reference. Across the hall, the small bathroom had a sloped ceiling, making the area hard to negotiate without hitting your head, especially if you were tall, but the solitary dormer window overlooked a series of balconies. The 1954 movie Rear Window, in which a wheelchair-bound photographer (James Stewart) spies on his neighbors from his apartment window and becomes convinced one of them has committed murder, came to mind. Another plot point in a new Darcy thriller? On our first night in Prague, we decided to eat at the hotel restaurant. Before dinner, we unwound with a glass of wine in the lobby and listened to rain pelt the windows. We hoped the weather would clear overnight, for the next day we had a full agenda. This entry was posted in Travel and tagged Author Pat Krapf, Budapest, Europe, European travel, Hungary, Prague, train, traveling Europe on April 2, 2015 by Pat Krapf.